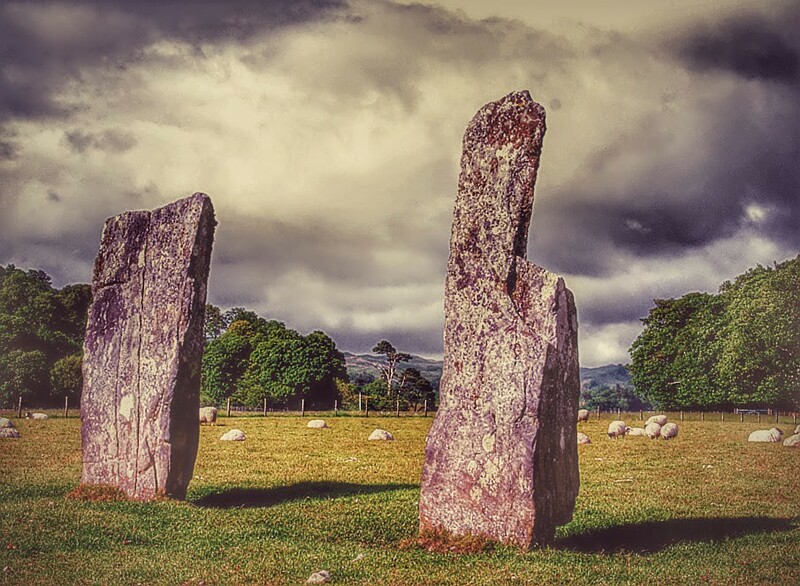 North of Lochgilphead, on the A816 to Oban, is Kilmartin Glen, an area of Neolithic and Bronze-Age chambered and round cairns, stone circles, rock carvings, Iron-Age forts and duns, Early-christian sculptured stones and medieval castles. Most notable of all is the linear cemetery, a line of burial cairns that stretch southward from Kilmartin village for over two miles. The largest and oldest of the group is the Neolithic cairn, Nether Largie South, which is over 5,000 years old and big enough to enter. The other cairns, Nether Largie North, Mid Nether Largie and Ri Cruin, are Bronze Age and the huge stone coffins show carvings on the grave slabs. Nearby are the Temple Wood Stone Circles, where burials took place from Neolithic times to the Bronze Age. On the other side of the A816, and visible from the road, is a group of monuments which can all be reached from Dunchraigaig Cairn. This is a huge Bronze-Age cairn with some of the covering stones removed to reveal three stone coffins. From here a path is signed to Ballymeanoch Standing Stones, the tallest of which is 12-ft high. 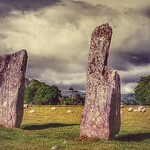 Two of the stones are decorated with cup marks, prehistoric rock carvings that can be found at numerous locations throughout the Kilmartin area. There's also a henge monument in the same field. These were generally round or oval platforms with an internal ditch, and it's thought they were used for ceremonial purposes. The best example of rock carvings is at Achnabreck, near Cairnbaan village, the largest collection anywhere in Britain. The purpose and significance of these cup- and ring-marked rocks is still a matter of debate. Before exploring this fascinating area, it's a good idea to stop off at Kilmartin House, the multi award-winning interpretive centre, housed in the old manse next to the parish church in the tiny village of Kilmartin. The imaginative and interesting museum helps to explain the bewildering array of prehistoric sites lying all around, and includes artefacts from the various sites and prehistoric music. 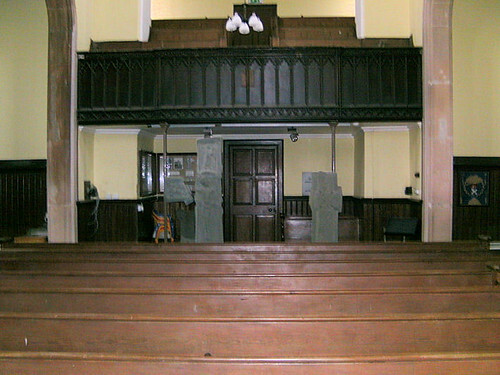 Upstairs is an audio-visual display which tells the story of this unique corner of Scotland. The café/restaurant does not disappoint either, and serves cheap snacks and meals, using local produce, and excellent coffee from 1230 till 1700. Daily all year 1000-1730. Adult £3.90, concession £3.10, children £1.20. Telephone. +44 (0)1546 510278. Next door in the church graveyard are the Kilmartin crosses, dating from as far back as the ninth and 10th centuries. Also within the graveyard is one of the largest collections of medieval grave slabs in the West Highlands. Two miles north of Kilmartin, sitting high above the A816, is Carnasserie Castle, an imposing 16th-century tower house built by John Carswell, Bishop of the Isles, who translated The Book of the Common Orderin 1567, the first book to be printed in Gaelic. Entry to the castle is free, but it's a little way from the car park. A few miles south of Kilmartin village is the Iron-Age hill fort of Dunadd, which stands atop a rocky outcrop and dominates the surrounding flat expanse of Moine Mhór (Great Moss), one of the few remaining peat bogs in the country and now a Nature Reserve. Dunadd Fort became the capital of the ancient kingdom of Dalriada around 500 AD and is one of the most important Celtic sites in Scotland. The views from the top are wonderful and worth the visit alone, but you can also see carved out of the exposed rock, a basin and footprint, thought to have been used in the inauguration ceremonies of the ancient kings of Dalriada. There's also an inscription in ogham (a form of early writing from Ireland) and the faint outline of a boar, possibly of Pictish origin. Often ignored by visitors focusing on the stones in the churchyard, these crosses inside the church should not be missed either. The older dates before 10th century. If you want to spend more time exploring Kilmartin Glen, there are a few accommodation options. Opposite the church is Kilmartin Hotel, Tel. +44 (0)1546 510250, Fax. 606370, which is comfortable and serves meals all day. 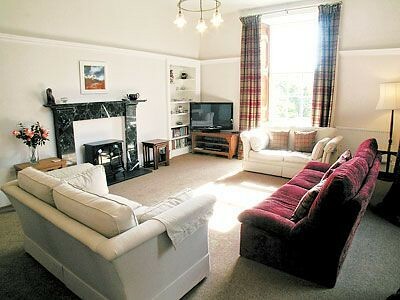 There are also a couple of cheaper B&Bs to choose from, including Burndale, Tel. +44 (0)1546 510235, and Tibertich, Tel/Fax. +44 (0)1546 810281, www.tibertich.com, a working sheep farm just north of the village. A good place for lunch is the café at Kilmartin House, otherwise, there's The Cairn restaurant, Tel. +44 (0)1546 510254, which serves very good, moderately priced Scottish and European dishes using local produce (open Mar-Oct from 1700).